NEW! Download Music! NO CD´s ! Our new CD, "Days of Majesty," represents the culmination of over eight years of painstaking research and development. Letter by letter, we have translated the Hebrew text into its equivalent musical note. Talented musicians have used these notes to play the beautiful melodies you hear on this CD. The eleven pieces on this CD represent only a small fraction of the music yet to be uncovered in the Bible. By acquiring this CD you are making your personal contribution to our project, and enabling us to complete this monumental task. We want to thank you for your support. Our goal is to translate the entire Hebrew text of the Bible to musical notes and to make it available to all people. We created the Bible Music Writer computer program to help more people become involved in bringing the music from the Bible to life. The program you have purchased here is the basic platform that will allow you to begin translating music from the original Hebrew text of the Bible. The formula based on ancient traditions is built into the program so you do not need to know Hebrew or be a musician to do so. Highlight any verse or portion from the Hebrew text and translate it to musical tones in quarter notes. Hear the notes (letters)play in the same sequence as it is written in the Hebrew text. The notes will be written and recorded automatically on the staff. You can change the speed by which the notes are being played, and find the melodies imbedded in the text. If you have a music program that allows more flexibility you can export the notes, orchestrate them and add musical instruments to fully develop the music. Change the header and the footer on the page and print out basic sheet music in quarter notes. In the near future we will add more features to this platform so it will be possible to develop more of the music right on the Bible Music Writer program. All these new features will be published in new versions of this program that will be released shortly and are provided to you FREE of charge. Please use the number provided on the inside cover of the CD to get your free upgrades. As more people become interested in becoming actively involved in the Music from God Project we anticipate new and beautiful melodies to become available. If you are not a musician but happened to discover such melodies please do not hesitate to contact us and one of our professional musicians will be happy to help you bring your discovery to completion. Thank you for taking part in this worthy endeavor. Hebrew tradition is rich in ideas about the nature of the universe and the special relationship of the ancient Hebrew language to reality. According to the rabbis, when the LORD began to create the world, he used the powers of the Hebrew letters to bring it into existence. All of creation reflects the divine order which in turn is represented by the divine language and its symbols - the Hebrew alphabet. We are beginning to accumulate our research and to make it avavilable to our friends and sponsors via this website. There will be articles from traditional sources as well as new work that is being done on the way music both reflects the order of creation and is instrumental in healing both body and soul. If human music is theraputic, what can we say about music that derives its power from the Torah? If you would like to be kept abreast of these new postings, please sign up for our free email newsletter. This is a short, periodic update on what we are doing. Just to let you know, we do NOT share our lists with anyone; your privacy will be respected. We thank you all for your continued encouragement and support in this undertaking. Responding to popular demand, we have produced a computer program that will allow anyone to actually write and compose music from the Hebrew text of the Bible. 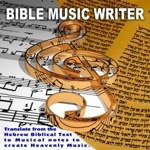 With BIBLE MUSIC WRITER you can select any verse or chapter from the entire Tana"ch and turn it into music. The program will also record the sequence and provide the score for further development and orchestration. For all of our musically inclined friends and those who are real musicians, here is a fascinating YouTube demonstration of the creative process involved in making beautiful melodies from the Hebrew text of the Bible. Beautiful music for healing and mediation from the Hebrew text of Isaiah, by classical guitarist, Susan Grisanti.